In addition to his work promoting his own Fiddle Workshops and Slow Sessions, Tom has appeared as a Guest Clinician at college, university, public and private school, and symphony-sponsored music and string camps throughout the Gulf Coast. He has also taught as a guest faculty member for SCOR! Adult String Camps, and as a regular faculty string teacher for the O’Connor String Method Camp in Charleston, SC (2011-present) and Fiddle Hell Massachusetts. “I have observed Tom’s gift for teaching many times. His commitment to helping students of all ages develop their own talents is remarkable. He has created educational programs that are perfectly suited to ignite the passion for music in the young and the young at heart. 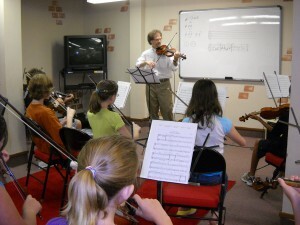 As examples, for Mobile Symphony’s programs, Tom created a two-week summer strings camp for beginning and intermediate students and directed a four-day Chamber Music Festival for players of all ages. As a lecturer, he has worked regularly for over a decade with the University of South Alabama Road Scholar (formerly Elderhostel) program. Tom is available to appear as a guest clinician or lecturer at your school, summer camp or community function. Contact him at: flyingfrog@aol.com.